When it comes to returning to an earlier time, people always say "you can never go back." Here at Woodstock Candy we have the next best thing to a time machine. It's called retro candy, and it's a fun way to reconnect with your childhood memories. People tend to have very clear memories of tastes and smells from when they were kids. Some of them distinctly remember foods that their grandmothers used to make, like an apple pie, chocolate chip cookies, or rice pudding. Other people (our kind of people) remember particular candy that they loved as a kid. These memories can make you feel warm and fuzzy, and that's a good thing. The marketplace is always trending to earlier styles, fashions, decor, candy, and food. 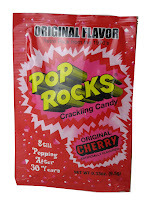 To follow suit, Pop Rocks candy has recently come out with one of their original flavors. Cherry Pop Rocks are in the same 1970s packaging you'll recognize from way back. This flavor is popular because the packaging makes you feel like you're right back in the '70s enjoying this crackling candy like you did when you were a kid. Pop Rocks were first invented in 1956, but not marketed until the 1970s. They became an instant cultural phenomenon and are still popular today. It's one of those candies that parents like to introduce to their kids. It's fun to watch the face of someone trying Pop Rocks candy for the first time. Other candy that can take you back in time are Candy Cigarettes, Candy Buttons on Paper, Razzles, Pixy Stix, and Good & Plenty.